So I’ve searched and searched and couldn’t find a good technical answer. “Can I use alkaline battery in my car? This kind of insinuates that with nimh, I DON’T need to remove the batters when I’m done. What says the brain trust???? Always take the batteries out of your car. It's not the end of the world if you leave them in for a short period, but they can over-drain and leak, and contribute to electrical corrosion on the board. Even when the power switch is off, there will be a low power draw because the circuit is still closed. This will damage the cells, and there is also a possibility that it could damage the electronics as well. The car is only truly off when the cells are removed, as there is still power going through the board even with the switch off. Does anyone have an electrical diagram? If one side of the circuit goes through the switch, then the circuit can’t be completed... as long as this is a normal switch. On some of my larger RCs, the esc controls on/off, so it does constantly draw power keeping the esc Alice enough to monitor for switch press. No, I dont have an electrical diagram. I do know that there have been Mini-Z cars that have blown their fets in the pits with the switch off... since then, I always remove a cell if my car is not in use to ensure that the circuit is not closed. I don't have a diagram either, but I can tell you the switch occurs on-board, not prior to the board. The power leads connect directly to the board, and there are two switch contacts. To me, this means that if batteries are in, power is flowing to some part of the board. Well, a quick look at the board proves you are right. The red and black wires come from the batteries (in series), and the two paired black wires go to the switch. It appears one doesn’t need to remove all the batteries, just one will do. Thanks for the insight, everyone. The switch is a physical disconnect which de-energizes the car. It's not like bigger 10th and 8th scale stuff where you press a button to power up. In those cases, you would be correct to say it is powered at all times because there is a circuit connected across the battery so long as it is plugged in. It's a very low draw but because there is a complete circuit, there is still *some* draw. Mini-Z is different - The switch is a physical disconnect. You can actually rewire the cars with only three wires rather than 4 and it works perfectly normally, better in fact if you use upgraded wiring as it reduces series resistance/I2R losses, particularly on the screw terminals that stock cars use. Though I should note this is really only noticeable with particularly fast motors and strong batteries. Look at the picture above. The pad in the center which has two wires soldered to it is completely isolated from the rest of the board. Kyosho only did this 4 wire arrangement to make it easy to remove the electronics package without soldering. This is tricky to explain with words so I made a crude diagram below. Pardon my (lack) of artistic talent. The first diagram shows stock wiring with the screw terminals. The second diagram shows how I wire all my cars, usually with 22-20 Ga silicone wire. In either case though, when the switch is open, power is physically disconnected from the car (open circuit) and current does not flow. I completely agree that batteries should be removed from the car when it's not being driven, but factually, so long as the car is switched off, the batteries do not drain. Last edited by TeeSquared; 2019.02.04 at 12:26 AM. This image should also clarify the stock wiring diagram. And finally, here is an example of the upgraded wiring described on a Mini-Z F1 MF015 chassis. genius.... nice diagram... nice to see it on an actual car (in this case an F1) i guess it would be easier to illustrate compared to the mr03 chassis... so i guess if you have good soldering skills... it would be great wiring it as you pointed out... is there any benefit to this type of wiring? TeeSquared, great info about the switch. 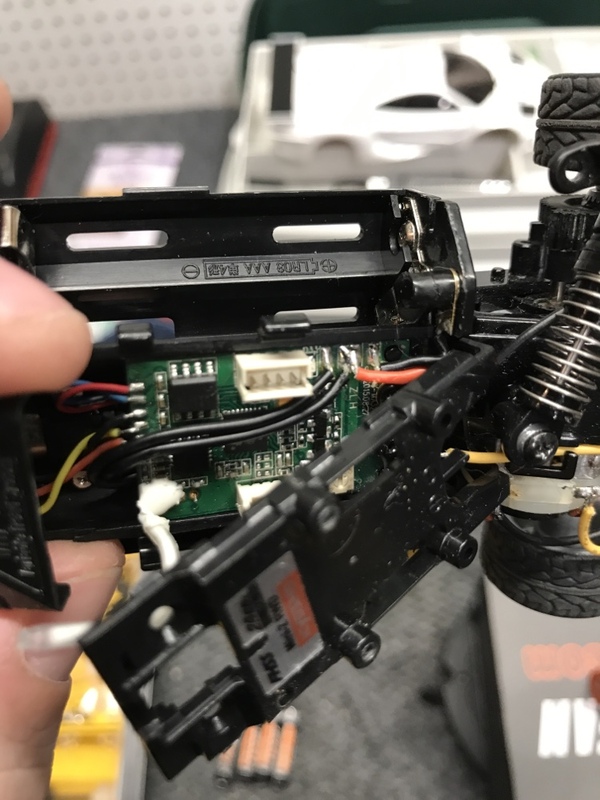 So, all power goes through the switch, no wonder my switch blew up using lipo a few years ago, since then I always remove it on cars with lipo. And when bypassing the switch, I assume that soldering a single wire to the 2nd terminal for the switch would be appropriate rather than just bridging the terminals. Great to know.